Sorry, I have been MIA the past few days. I lay around and watched TV the 3 days Sam was gone to take Corbin home. Yesterday I worked on some blog stuff. Today I have the adorable treat boxes that we made while Corbin was here for his classmates. 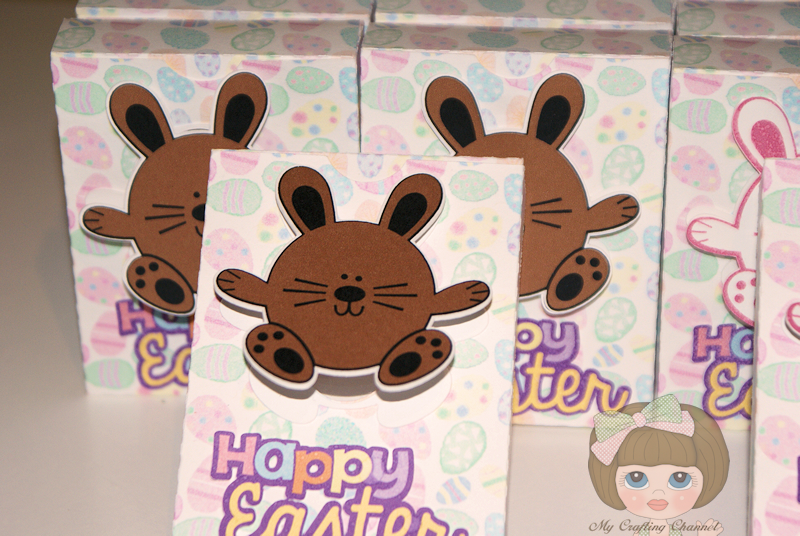 I took the Bunny by Miss Kate Cuttables and made a shaped card. 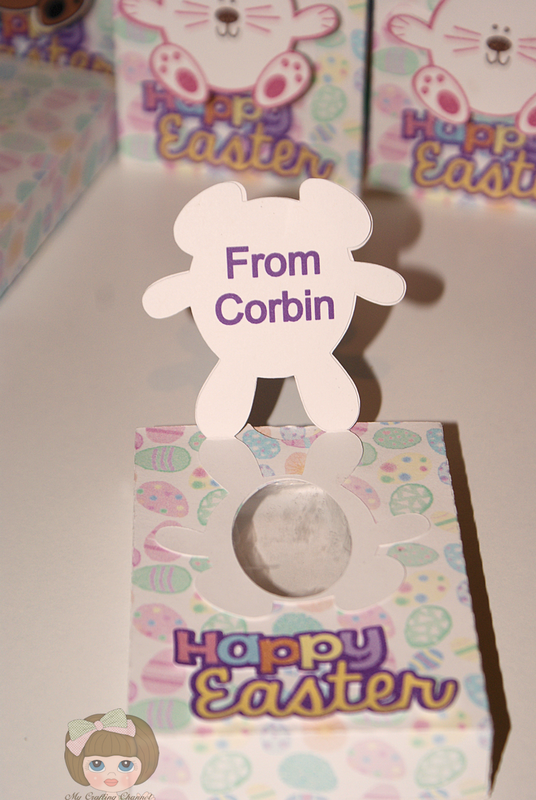 Then I cut out an egg shaped in the tummy of the bunny and printed From Corbin to the top inside. Then I took the 3D Conversation Heart Box by Lori Whitlock and removed the heart replacing it with the same egg shape. Corbin picked out the paper for the boxes and we print and cut using the Silhouette. We added transparency film over the egg shaped. We folded the card and then took the bunny which instead of layering we welded together and glued to the top of the card aligning the egg shape on the box to the egg shape on the card. Corbin wanted the girls pink and white and the boys had to be chocolate. 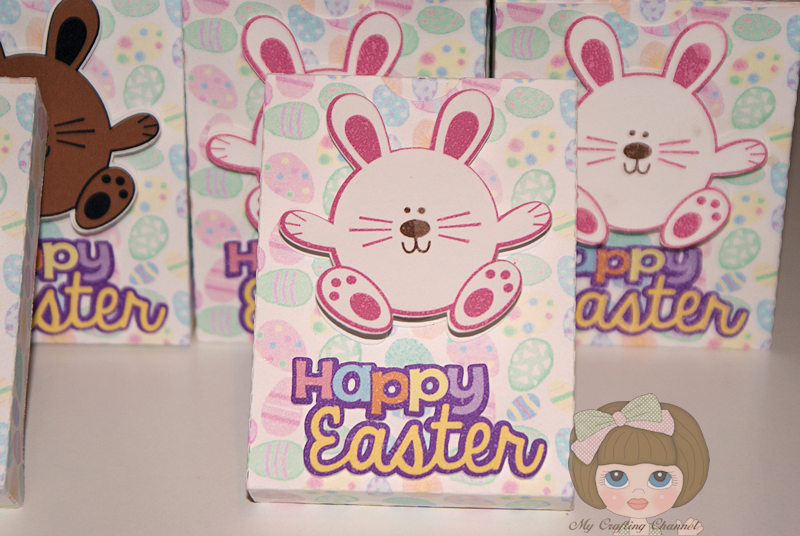 We added the Happy Easter Title by Michelle Renee to the box and he was very pleased with how they turned out. We did not put candy in them, that is something his mom will do. WOW Nana these treat boxes are sooo super adorable!!!! I love the paper and the cute bunny!!!!!! TFS!!! Have a great day. those are fantastic!! love the way you created a tag with the bunny so that it opened up and revealed the giver's name - very clever!! These are so super cute!!! These are adorable!!! What a fun project! 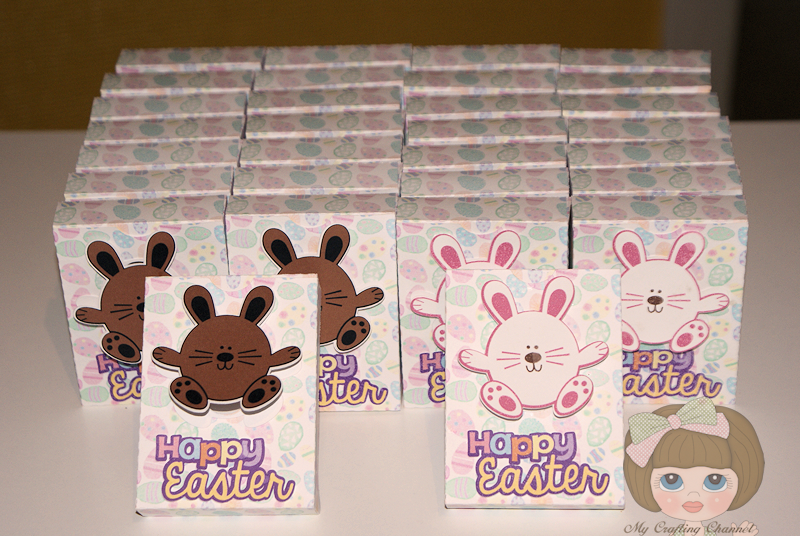 Your Easter bunny treat boxes turned out adorable! These are way too adorable. His classmates will love them. They are all adorable!! Corbin did an AMAZING job on these Treats!! The class will love them!! Thanks for leaving my bloggie love over at Trendy Twine!!! These are so cute and adorable. Corbin's classmates will loves these! Thank for sharing on the linkup party. How darling are these?!?!? What a fun project! So glad you joined our challenge at My Craft Spot this week! super cute idea! Thanks for joining the fun at My Craft Spot!